Paul McCartney’s historic three-night musical christening of New York’s Citi Field, witnessed by 120,000-plus attendees and universally hailed as a concert experience for the ages, will be immortalized November 17 when Hear Music/Concord Music Group releases “Good Evening New York City”. This momentous musical experience will be available in two formats: a 3-disc (2 CD + 1 DVD) standard edition and a 4-disc (2 CD + 2 DVD) deluxe version featuring expanded packaging and a bonus DVD including McCartney’s traffic-stopping, headline-making July 15 performance on the Ed Sullivan Theater marquee (including bonus numbers not aired on the Late Show with David Letterman broadcast). Apparently wowing North American audiences wasn’t enough, because before the year is out, Sir Paul will embark on his first European tour in five years entitled “Good Evening Europe”. The 8 night trek will commence in historic Hamburg (where The Beatles cut their cut their teeth as a young band) and finish off before his hometown crowd in London, England. US entrants only please, contest ends on November 23, 2009. One entry per household please (IP checking enforced). Check out the full album press release and official track listing after the jump. Paul McCartney’s historic three-night musical christening of New York’s Citi Field, witnessed by 120,000-plus attendees and universally hailed as a concert experience for the ages, will be immortalized November 17 when Hear Music/Concord Music Group releases Good Evening New York City. This momentous musical experience will be available in two formats: a 3-disc (2 CD + 1 DVD) standard edition and a 4-disc (2 CD + 2 DVD) deluxe version featuring expanded packaging and a bonus DVD including McCartney’s traffic-stopping, headline-making July 15 performance on the Ed Sullivan Theater marquee (including bonus numbers not aired on the Late Show with David Letterman broadcast). The set will also be made available in high quality vinyl. In any configuration, the 30+ songs and nearly 3 hours of music comprising Good Evening New York City are a must-have for attendees wishing to relive the July 17, 18 & 21 shows, those who couldn’t get tickets and/or anyone interested in an audiovisual document of a living legend. Good Evening New York City marks McCartney’s 2nd release for Hear Music. The first was 2007’s highly acclaimed Memory Almost Full. The standard version of Good Evening New York City will be available at participating Starbucks company-operated locations in the U.S. and Canada and wherever music is sold. As the inaugural musical event at Citi Field, the site of the former Shea Stadium, the July 2009 shows held special significance not only for McCartney but for generations of his fans. The shows were performed on the same hallowed ground that The Beatles, in 1965, played the 34-minute show that would set the precedent for the modern day stadium rock show–and where in 2008 McCartney joined Billy Joel for the final rock show before the original stadium’s demolition. As documented on Good Evening New York City, “I’m Down” from the 1965 set list was revived for the Citi Field shows, albeit this time played through a PA that was not overpowered by screaming fans (though there were still several thousand who tried). Other highlights of Good Evening New York City include faithful takes on Beatles classics “Drive My Car,” “Got To Get You Into My Life,” “The Long And Winding Road,” “Blackbird,” “Eleanor Rigby,” “Back In The USSR,” “Paperback Writer,” “Let It Be,” “Hey Jude,” “Helter Skelter” and more, plus “Something” rendered on ukulele gifted to Paul by George Harrison, and a tribute to John Lennon in the form of a medley of “A Day In The Life” and “Give Peace A Chance.” Wings era chestnuts include “Band On The Run,” “My Love,” “Let Me Roll It” and the pyrotechnic tour de force of “Live And Let Die,” while timeless McCartney solo material ranges from “Here Today” to the upbeat “Flaming Pie” and “Dance Tonight” to a pair of numbers from Electric Arguments, the 2008 album released under the alias of The Fireman. 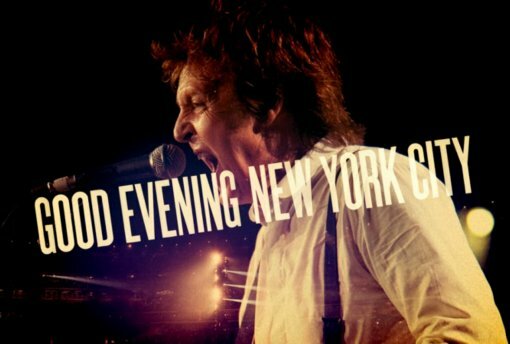 The concert footage featured on Good Evening New York City standard edition features concert footage directed by Paul Becher, who has overseen live visuals for McCartney for some 200 performances and counting. The 33-song 2 hour 40 minute performances were shot in High Definition using 15 cameras and digital footage incorporated from 75 Flipcams handed out to fans over the course of the three night stand. The audio mix, in both stereo and 5.1, was handled by longtime McCartney engineer Paul Hicks, whose credits include the recent Beatles remasters, The Beatles Anthology, Let It Be… Naked and two Grammy awards for his mixing work on the Beatles’ Love album. The deluxe edition bonus DVD will feature footage of McCartney’s July 15 performance on the outdoor marquee of the Ed Sullivan Theater, previously available only as a webcast on the Late Show with David Letterman website. The marquee set, which marked McCartney’s return to the site of The Beatles U.S. television debut, generated front page headlines and literally stopped traffic as word of mouth generated a crowd that packed Broadway from Columbus Circle to Times Square. Paul McCartney’s July 17-21 Citi Field stand has already been unanimously hailed by critics and audiences alike as the concert experience of a lifetime. On November 17, Good Evening New York City will document it for the ages. LOVE THE BEATLES! THANK YOU FOR THE CONTEST OPPORTUNITY! I’d love to win this – thanks for the chance. I still think Paul should have been my husband!